On the corner of 14th Street and 1st Avenue, where we once reviewed the short-lived Meatball Factory, there now sits a welcome addition to this trending East Village neighborhood: Bait & Hook Seafood Shack. Specializing in seafood favorites and American comfort food, Bait & Hook flaunts a warm, intimate interior and minimalist nautical décor that includes authentic, re-purposed lobster traps suspended from the ceiling and ship’s wheels adorning the walls. Restaurant manager Mitchell tells us that additional custom artwork has been commissioned specifically for the restaurant that will soon arrive to enhance the seaside theme. 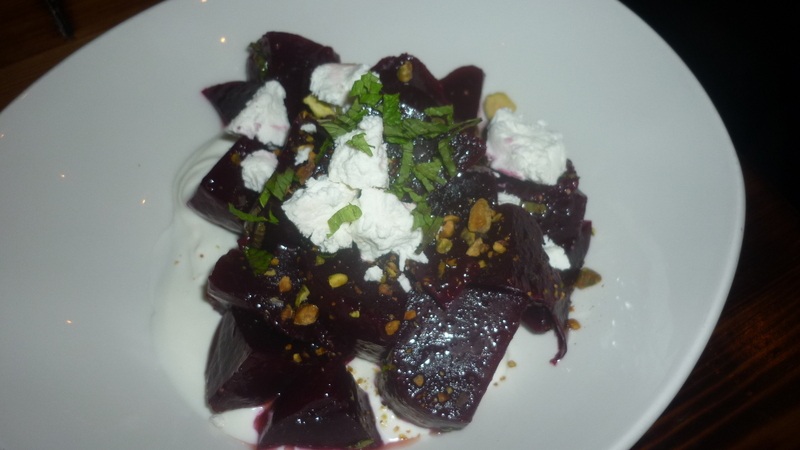 To start off the meal we enjoyed the Roasted Baby Beets Salad ($9), one of our favorites. This dish has an especially refreshing taste owing to the addition of fresh chopped mint with added texture from crumbled goat cheese and toasted chopped pistachio nuts — an interesting touch! Serving size is large enough to share. 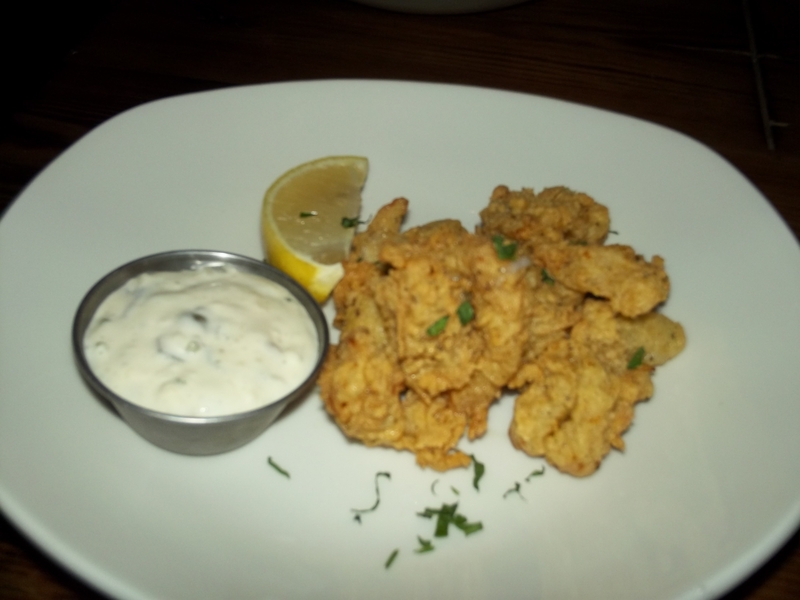 We also sampled a half portion of Fried Ipswich Clam Bellies (a full-portion is $14) served in a classic style with tartar sauce and lemon wedge. These clams were fat and tender and quick fried crispy in a tasty, seasoned batter. Bait & Hook also offers a Fried Clam Roll at $16. For main dishes we chose to split two of the restaurant’s signature sandwiches. 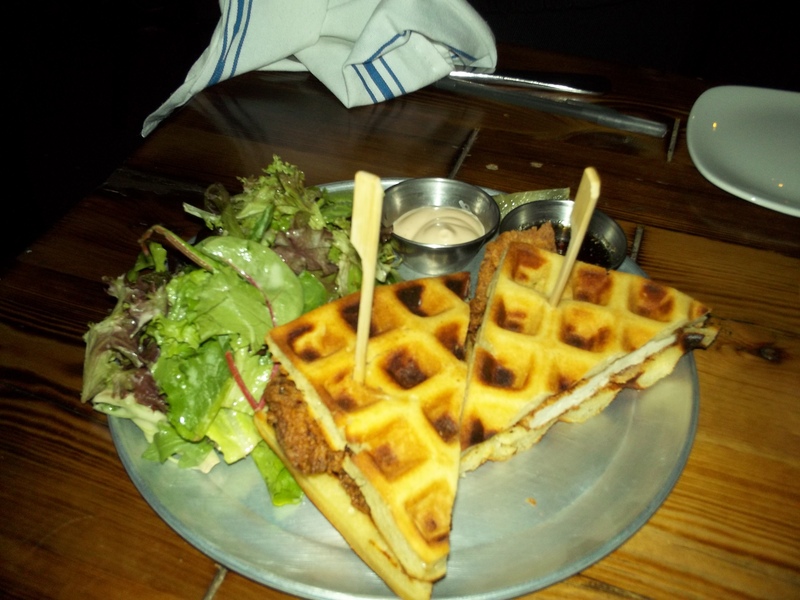 A unique specialty to Bait & Hook is their Chicken Waffle Sandwich ($12). Using the crisp and light waffle as the bread, the sandwich features a tender and moist fried chicken breast which is served with the contrasting additions of a sweet maple syrup as well as a lightly Tabasco-spiked mayonnaise. The sweet syrup will give you the flavor of the traditional Chicken and Waffle entrée that is so popular across the country, while the Tabasco Mayonnaise brings out the savory flavor of the chicken for a more traditional chicken sandwich taste. This dish is served with a generous side of fresh greens tossed in light Dijon-vinaigrette dressing. 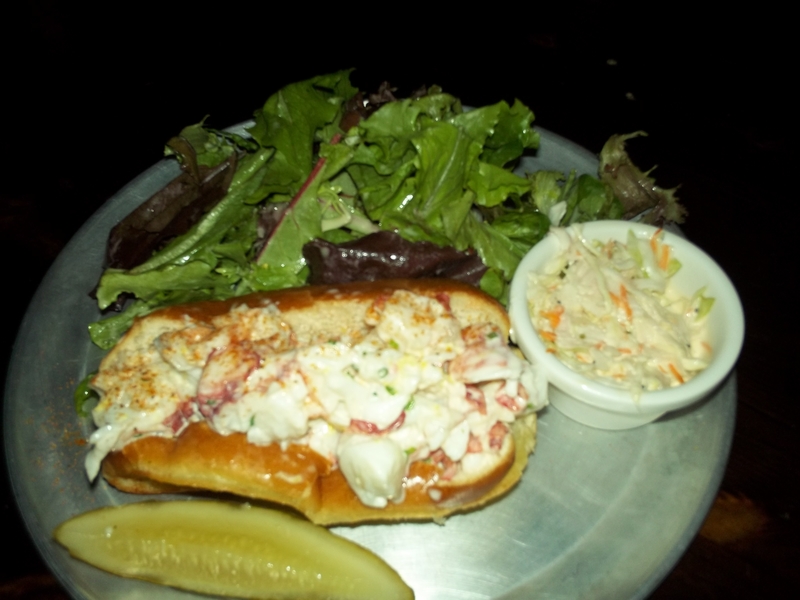 Of course, at any seafood specialty restaurant, a Lobster Roll is a must-try and Bait & Hook’s (at $21) is no exception. 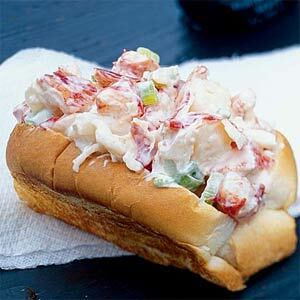 Although the sandwich is reasonably sized, the amount of sweet, tender chunks of lobster meat is amazing! Lightly dressed with mayonnaise and lemon zest and served on a toasted buttered soft roll this ample sandwich also includes a side of field green salad and a side of delicious, crisp coleslaw, which is enhanced with a light shaving the fresh onion. 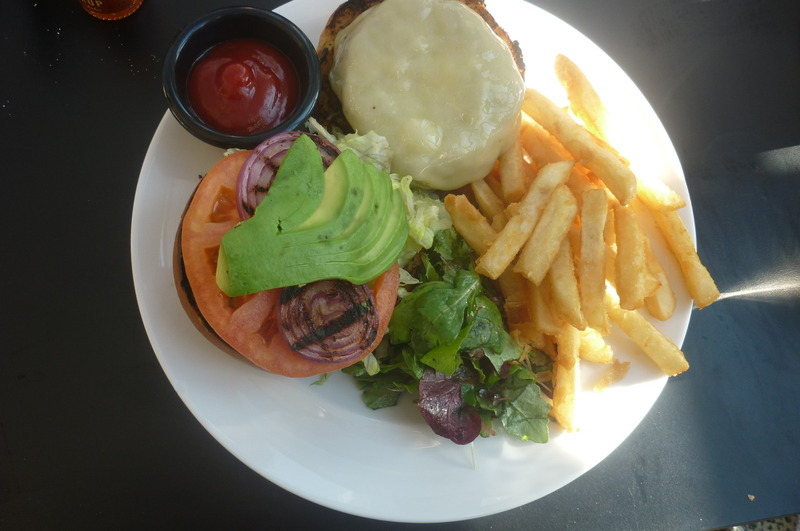 Although the portion of this sandwich is appetite-satisfying on its own, we would suggest adding a side of French Fries (or perhaps even Cheddar Grits) priced at $5.00 each. 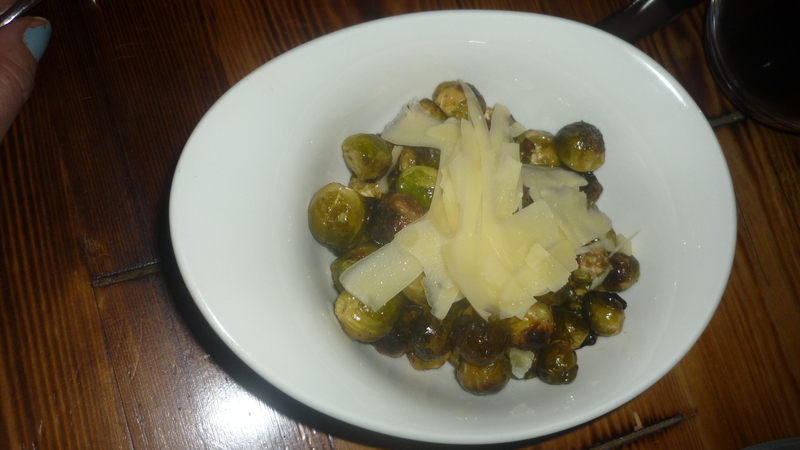 We chose to go in a less traditional route with our sides and sampled the Roasted Brussels Sprouts, which were topped with a generous shaving of Gruyere cheese. These tiny sprouts have a distinctively different flavor and texture than larger, leafier sprouts, giving them a taste similar to that of roasted chestnuts. This may be an acquired taste for some, so just be aware before ordering. Again, this side is portioned generously enough to share with friends. 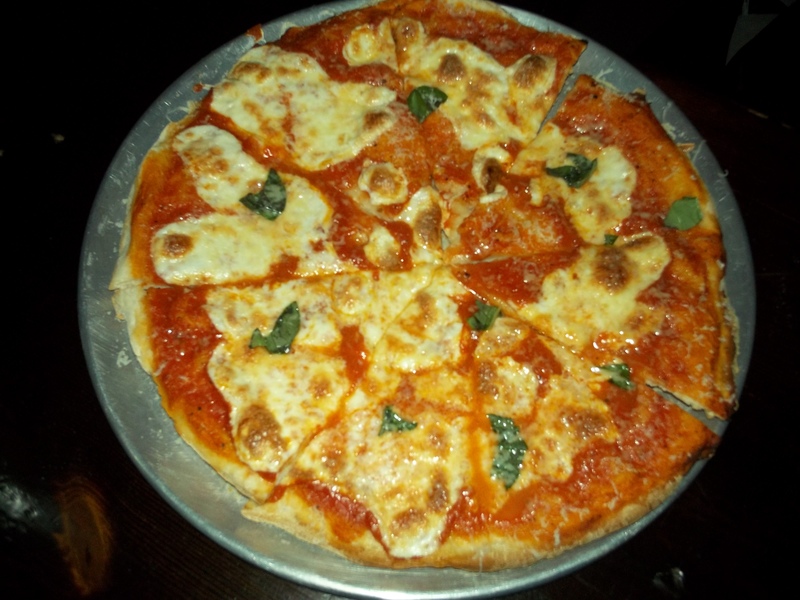 Bait & Hook offers a variety of four thin-crust pizzas on the menu, and we had to try the Classic, made simply with fresh mozzarella, tomato sauce and basil ($8). The thin, crisp crust is actually a highlight of this pizza, and it would be the perfect dish to order as a shared appetizer if you are going to be ordering on the light side for your main entrée. 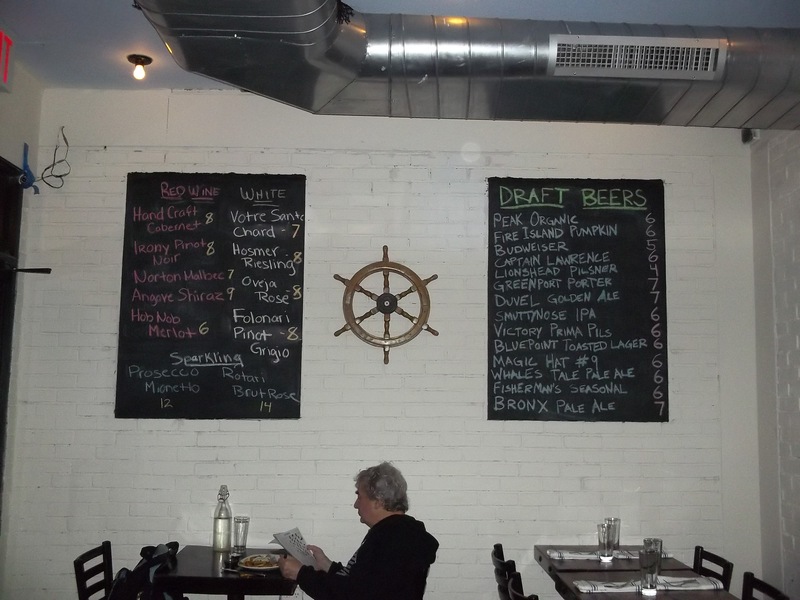 Bait & Hook’s other three pizza choices do feature seafood toppings including White Clam, Smoked Salmon (done bagel–style. with cream cheese, cucumber, capers and dill! ), and savory Crab Chorizo. We will have to return to try one of those unique combinations! You’re not going to have much room for dessert if you order as generously as we did, but if you still have a sweet tooth you can indulge in a choice of two desserts, including Banana Pudding (topped with crisp Vanilla Wafers and Bruléed bananas accented with just a bit of fresh whipped cream) and a Rocky Road Brownie Sundae, loaded with chunks of toasted pecans and topped with vanilla ice cream, chocolate sauce and toasted miniature marshmallows. Both desserts are priced at $6.00 each. If we could’ve eaten even one more bite we certainly would have been trying classic dishes such as the Lobster Mac & Cheese ($16), the perennial favorite beer-battered cod Fish & Chips ($14) or Crab Cakes ($17). Fortunately, Bait & Hook Seafood Shack is in the neighborhood and priced for our budget. With its friendly service and welcoming atmosphere, we will be back. 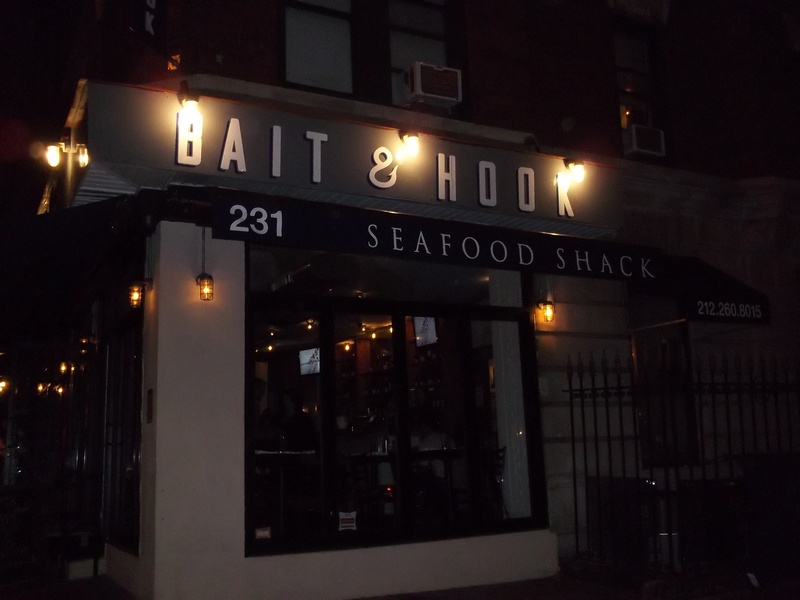 Bait & Hook Seafood Shake is Located on the Northwest Corner of 14th Street and Second Avenue in New York City. Phone (212)260-8015 for hours, specials and more information. 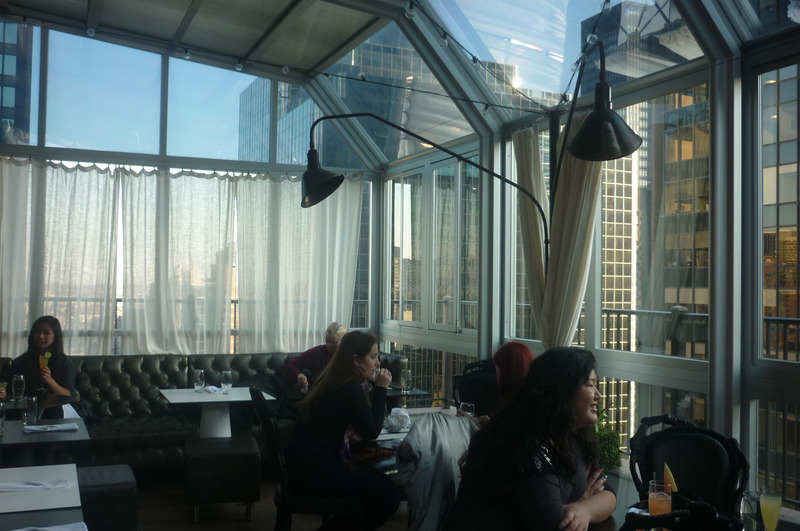 Brunch Hot Spot: Upstairs at the Kimberly! Ah, weekend Brunch in NYC. 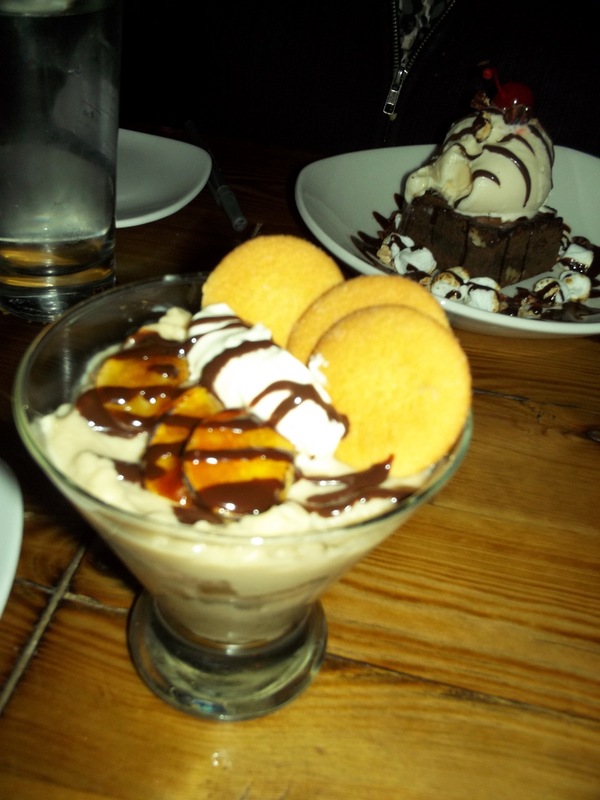 It’s a continuously evolving hot topic that keeps all of the Yelp reviewers on their toes! We love the funky East Village brunch scene, but sometimes we like to put on our fancy shoes and check out what’s going on a little further uptown. This past summer, we enjoyed a magical rooftop evening of unique and hearty appetizers, tall cool cocktails and stunning city views at the Penthouse level restaurant, Upstairs at the top of the Kimberly Hotel. As luck would have it, we heard that they also host a killer Brunch. On a recent, unseasonably warm Saturday we checked into Upstairs with a mind to investigate their Custom Bloody Mary Cocktail Cart. More about that later. First: Look at all this food! If you’ve brought along your serious appetite, you can begin your meal with the Upstairs Parfait made with Yogurt, Granola and Blood Orange Marmalade ($11), the Fresh Fruit Plate with Honey Crème Fraiche ($12) or something a bit more decadent in the form of an individual Pastry Basket stuffed with a Pain au Chocolate, a Muffin and a Fruit Danish ($14). Maybe you would want to share that pastry basket with a friend…maybe not. Egg dishes include the light and flavorful California Spinach Quiche ($13) and a fresh-from-the-farm Goat Cheese & Ratatouille Omelet ($14). Traditional Eggs Benedict is served three ways, with your choice of Canadian Bacon ($16), Smoked Salmon ($18) or Lobster ($24). There’s also a wildly indulgent Truffled Duck Egg Toast with Duck Prosciutto & Gruyere Cheese ($24). 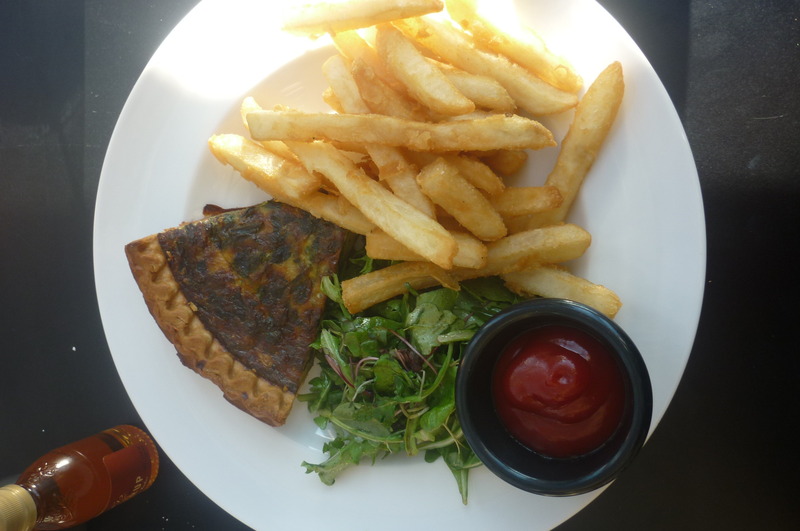 All Egg dishes are served with a mixed greens salad and Upstairs’ signature French fries, which are dipped in a light buttermilk/flour mixture before being fried to a golden crisp. Dishes priced at or over $14 include your choice of a Bloody Mary or Mimosa. Brunch! 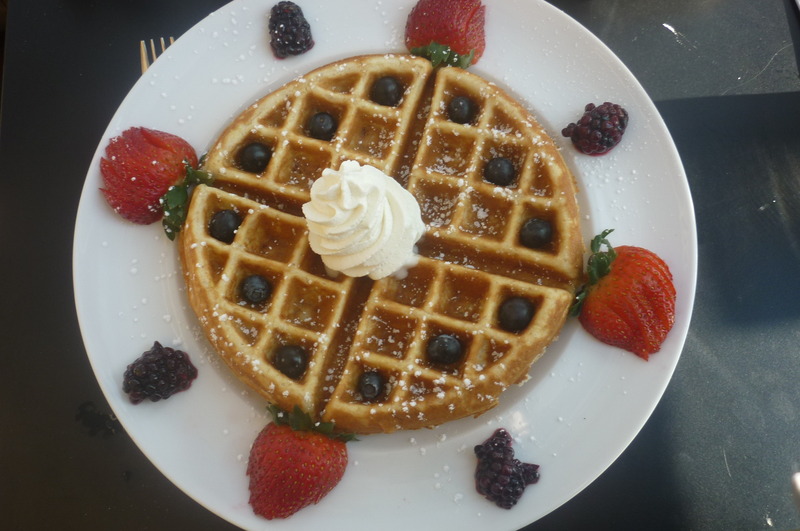 A Breakfast Sweet Tooth can be sated with an order of Whole-wheat Blueberry Pancakes ($14), Brioche French Toast with Blackberry Salad ($14) or an amazing Buttermilk Waffle with Vanilla Whipped Cream and Mixed Berries ($14). If you’re feeling more like Lunch than Breakfast, nobody does the Kobe Beef Burger (with White Cheddar, Avocado and Grilled Red Onions, $18) quite like Upstairs, and the Lobster Roll ($18) might hit the spot as well. Mixologist Albert Mixes Up One Helluva Bloody Mary! 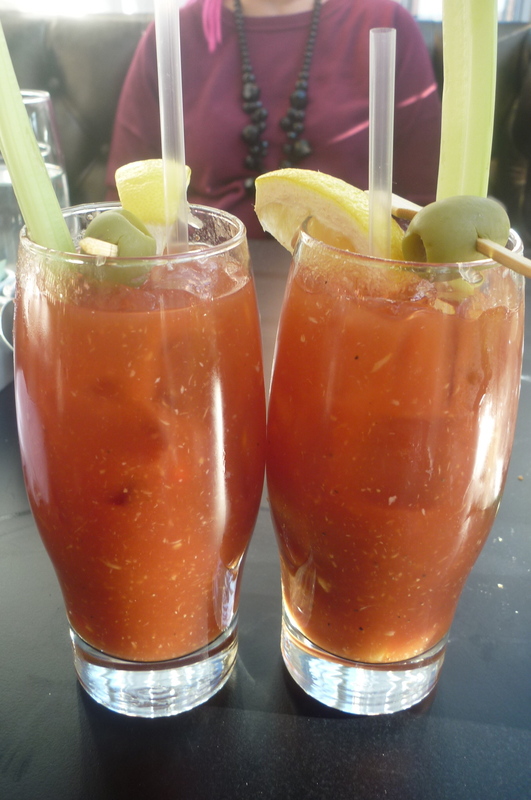 And now let’s talk about those Bloody Marys, shall we? While Upstairs has a full bar during Brunch, where a perfectly acceptable Bloody Mary will set you back $10, you might want to consider going for the mixed-to-order version for an extra fiver. 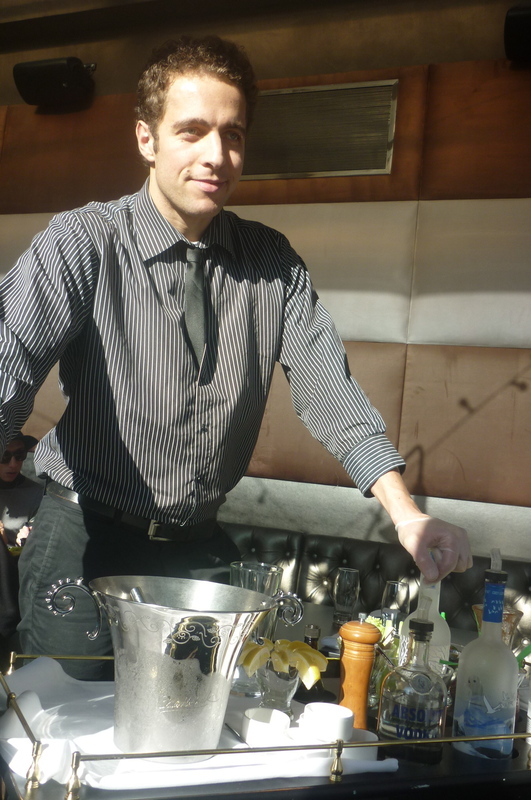 These premium Bloody Marys, which are gigantic and meant to be sipped slowly, are prepared and served tableside by a handsome and knowledgeable mixologist named Albert, who mans the cart with great skill. Start off right with your choice of three premium vodkas – Grey Goose, Ketel One or Absolut – then choose your desired level of heat – from one to ten – and tiny scoops of prepared horseradish are added accordingly. Additional add-in seasonings and spices available to suit your taste include crushed red pepper, ground black pepper, mustard seed, cayenne pepper, chili pepper and Old Bay seasoning – which you can add into the Vodka and tomato juice mixture or have applied to the rim of the glass. Fresh extras include slivers of crisp red bell peppers, jalapenos, lemon wedge and the traditional tall stalk of celery garnish. Holy cow, that is one potent Bloody Mary: well worth the 15 Bucks! Brunch at Upstairs at the Kimberly: You’re Doing it Right. Upstairs is located at the Kimberly Hotel, Penthouse Level, 145 East 50th Street (East of Lexington) in New York City (Take the 6 Train to Lexington and 51st Street). For reservations please phone 212-888-1220. Brunch is served Saturday and Sunday from 11:30 AM-3:30 PM. Proper Attire is Required.